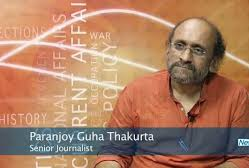 Paranjoy Guha Thakurta is an Indian journalist, political commentator, author and a documentary film maker. His works have appeared in print, radio, television and documentaries. The Story Behind the Story: Why has the Government Moved Against Reliance Now?